Frontotemporal dementia (FTD) is a clinical term that refers to a group of progressive neurodegenerative disorders that affect the frontal and temporal lobes causing personality change (apathy, disinhibition, loss of insight and emotional control), loss of the ability to recognize the meaning of words and objects, language dysfunction, and global cognitive decline. Three clinical FTD syndromes are recognized: behavioral variant of FTD, semantic dementia, and progressive nonfluent aphasia. Because behavior and personality change may be a presenting symptom, FTDs are often initially diagnosed as psychiatric disorders. FTDs have an earlier onset than AD and, at an early stage, do not cause the memory loss and visuo-spatial disorientation that are so characteristic of AD. There is an overlap between FTDs, amyotrophic lateral sclerosis, and atypical parkinsonian syndromes (progressive supranuclear palsy and corticobasal degeneration). There are several clinicopathological entities in the FTD group, which together account for 10 to 20 percent of dementia, being the second or third most common cause of dementia after AD and dementia with Lewy bodies. About 40% of FTLDs are familial, many of them autosomal dominant. Genes involved in autosomal dominant FTDs are MAPT, which encodes microtubule-associated protein tau, PGRN (progranulin), and C9ORF72. The term Frontotemporal Lobar Degeneration (FTLD) refers to the neuropathology of the FTDs. 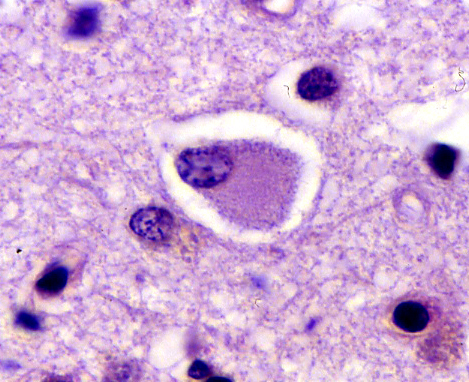 Pathologically, the FTLDs are characterized by atrophy of the frontal and temporal lobes (lobar atrophy) which contrasts the diffuse atrophy of AD, and by some or all of the following microscopic findings: neuronal loss and gliosis, vacuolization of the superficial cortex (spongiosis), and ballooned neurons. All FTLDs show also abnormal protein inclusions in neurons and glial cells. Based on the chemical nature of these inclusions, three groups of FTLDs are recognized: FTLD-TAU with tau-positive inclusions (tauopathies); FTLD-TDP with tau-negative, alpha-synuclein-negative inclusions which contain TAR DNA-Binding protein 43 (TDP-43) conjugated with ubiquitin; and FTLD-FUS, containing fused sarcoma protein. Though degeneration in FTLDs is primarily cortical, there are pathological changes in the substantia nigra and other subcortical structures. The pathological diagnosis of FTLDs requires extensive tissue sampling and immunohistochemistry targeting tau, TDP-43, and ubiquitin. Our concept of FTDs and FTLDs is still evolving but significant progress has been made recently in sorting out these entities and other non AD dementias and getting insights into their pathogenesis and genetics. AD is also in part a tauopathy. In AD, the tau deposits (NFTs and neuropil threads) are present in the neuronal body and dendrites. In the FTLDs, both, neurons and glial cells are affected. Pick's disease. Frontotemporal atrophy (left). Pick inclusion bodies-tau immunostain (right). Described almost 2 decades before AD, Pick's disease has long been the prototype of FTLDs. It presents between 45-65 years with confusion and FTLD symptoms and has a progressive course lasting 2-5 years, sometimes more. In advanced stages it cannot be distinguished clinically from AD. The brain shows atrophy of frontal and temporal lobes, Pick bodies (tau-positive spherical cytoplasmic neuronal inclusions, composed of straight filaments), and Pick cells (ballooned neurons with dissolution of chromatin). Older patients may also have AD pathology. TDP-43, encoded by the TARDBP gene on chromosome 1, is a highly conserved nuclear protein, which is expressed in many tissues. Its functions have not been completely defined. In the TDP-43 proteinopathies, abnormally folded, hyperphosphorylated TDP-43, conjugated with ubiquitin, is deposited in neurons in the form of intranuclear, cytoplasmic, and neuritic inclusions. The core clinical and pathological phenotype of the TDP-43 proteinopathies is similar to that of other FTLDs. In addition, there is an overlap between TDP-43 proteinopathies and motor neuron diseases. Clinically, a significant proportion of ALS patients present with FTD symptoms or develop cognitive impairment later. Pathologically, TDP-43 inclusions are present in degenerating motor neurons in ALS and are also seen in the cortex and other locations. TDP-43 deposits are also seen in some cases of Alzheimer's disease, Pick's disease, Parkinson's disease, and diffuse Lewy body disease.